“We hope to get him today,” a police spokesman says of Justin Waiki after two of his associates were apprehended Thursday. (AP) — Two associates of a man suspected of killing a Big Island police officer have been arrested but the shooter remained at large, authorities said Friday. The arrests were made during a manhunt prompted by the killing of Officer Bronson Kaimana Kaliloa during a traffic stop Tuesday near Hilo, police said. The search was continuing for suspect Justin Waiki, 33, whose last known address was in Las Vegas. Authorities say he has a criminal record on the Big Island. Justin Waiki, the suspect in the fatal shooting of a police officer, is still at large. The U.S. Marshals Service, FBI and the U.S. Bureau of Alcohol, Tobacco, Firearms and Explosives are each offering $10,000 rewards for information leading to the capture of Waiki. The agencies are assisting with the search, along with state sheriffs. The two arrests were made after an undercover officer approached a suspicious pickup truck with a man and a woman inside late Thursday near Honaunau, across the island from Hilo. The officer drew his weapon and ordered the two people to leave the truck. Instead, they fled and police gave chase. Police and prosecutors on the Big Island have warned residents that harboring or attempting to help Waiki could lead to a felony prison term. 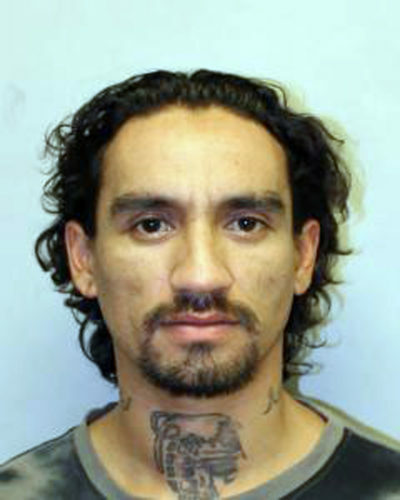 This undated photo provided by the Hawaii County Police Department shows Officer Bronson Kaliloa. 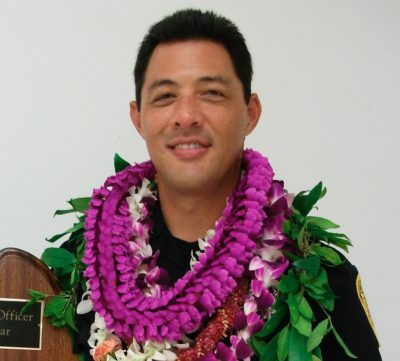 Kaliloa, 46, was the first police officer to be fatally shot on the Big Island. He had been married for 23 years and had three children. He was “Officer of the Year” for his district in 2014. Kaliloa’s niece, Kawehi Haug, sent a Facebook message Thursday to The Associated Press. “He was strong and kind and funny and smart and chivalrous and served his community every day as an honest and upstanding police officer whose convictions guided him to always do the right thing,” she wrote. She also said he was a loving husband and father. Haug said Kaliloa and his wife adopted their three children, ages 3, 4 and 7, through the state foster care system.